Pebble Stones are fun to work with because of all the different textures and colors - along with surprises, like streaks of quartz and other colors of sedimentary rock. Pebble Stones are normally smooth in texture - a characteristic mostly dependent on the level of association the pebbles have with different bodies of water. Other rocks or pebbles - either found on the beaches or various oceans and seas, rivers, lakes, ponds, or inland when water used to cover land - often leave marks from scraping against each other, leaving unique patterns from pebble to pebble. Beach pebble stones and river pebble stones are unique in their earthly formation and appearance, and fun in essence. The diversity and increasing popularity of the natural stone look has interior designers, architects, homeowners, contractors and builders all incorporating the look into residential and commercial projects. Pebble stones - including River Rock stones - can be used for so many different projects, indoor or outdoor. With all sorts of colors, sizes, polishes, and textures, they are perfect for: landscaping, construction projects, decorative accents, covering outdoor walkways and residential driveways, as pool lining around pools, accenting plant containers, or for various uses on patios and decks. These two collections are also considered eco-friendly, as they can be used to make water-smart gardens in areas where water is limited. Enjoy browsing the different collections inspired by Pebbles from popular brands Bati Orient, Interceramic USA, Bedrosians, Emser Rivera and Puccini. Natural Stone provides a luxurious and classically elegant feel to any indoor or outdoor, residential or commercial project. 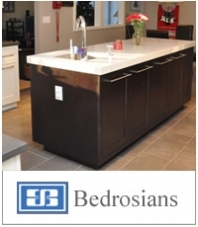 The earthy materials have also recently been stripped of the idea that affordable natural stone products do not exist, and popular Pebble Stones have emerged to the forefront of being an affordable finish option to all budgets. 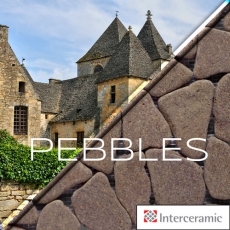 Pebble Stones are the perfect options for creating interesting mosaics and patterns in any project as no pair of pebbles are the same size or shape - making each piece in pebble stone collections exclusive and custom by default. 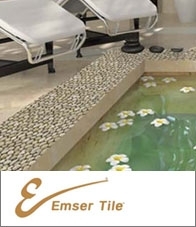 Pebble Stone tile is also becoming increasingly popular because of its versatile nature. Because of the earthy tones and natural materials, pebbles can go with any classic or contemporary styles with ease - creating the perfect ambiance and transformative look. Whether placing pebble stone decoratives and tiles outside or indoors, the use of pebble tiles is only limited by your wildest (or most honed) imagination. Pebble tiles are extensively used in outdoor areas, such as decks, walkways, and also make great flooring for indoor areas, such as kitchens or bathrooms. 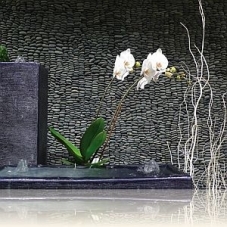 Pebbles also enhance the elegance of any outdoor feature, such as pools and fountains. Pebble tiles can also be used on walls. Heard enough? Enjoy browsing the Pebbles Gallery below.